Energy monitoring and optimisation should be critical to any business. The savings that can be made from energy efficiency can be significant. According to McKinsey electricity prices are anticipated to rise another 30% by 2020 so the need to monitor energy usage and eliminate waste is rising to levels higher than ever before. As a business, energy spend is unavoidable but not uncontrollable. The more you try to understand your energy consumption, the better you can refine it and run your business efficiently. Energy costs will only continue to rise, with energy bills already accounting for a significant proportion of business overheads. Energy monitoring systems seek to save money in waste reduction, but can also help with demand response capabilities. Demand response seeks to adjust the demand for power instead of adjusting the supply. When looking at demand response you can see that off-peak metering costs less. Some businesses therefore may choose to adjust their demand by postponing some energy rich tasks to different times of the day. By changing your power consumption to better manage supply constraints in this way you can reap the rewards in an otherwise competitive business environment. But energy monitoring is not only useful for making significant savings in usage patterns and wastage, it can also have a positive effect on your organisation in terms of revealing subtly under-performing or malfunctioning equipment. You will never really fully know how much energy monitoring will uncover until you start doing it, but other issues that may not present themselves in standard maintenance checks can prove quite literally life-saving. An example would be in the field of food operations when under-performing refrigeration units could be causing food waste and food safety liabilities. Or malfunctioning industrial equipment could quite literally be putting your employees in danger with added direct liability and welfare concerns. With the introduction of real time energy monitoring, undue system strain can be identified quickly in real time and localised prior to systems requiring complete shutdown. The advantage of early maintenance can prove much less costly in these instances, whereas without energy monitoring your systems can go past the levels of quick and easy maintenance and may require complete overhauls. Energy monitoring will also help to identify those pieces of equipment with an unusual energy draw. For example, a faulty air conditioning unit can increase a building’s energy consumption by as much as 50%. With continued monitoring such issues will be able to be resolved prior to significantly impacting on operations. If a device is running hot or drawing heavily on power, you will be made instantly aware of this in a real-time alert enabling maintenance before it impacts on productivity. When something doesn’t add up or behaviour is suggestive of an energy leak you will be able to notice it immediately. For those larger corporations, there may also be power constraints and regulations that need to be adhered to and so monitoring of consumption will help to ensure that your business remains within such levels. No matter what industry you are in, energy monitoring should be considered as a crucial way to keep you up and running whilst also giving significant competitive advantage. 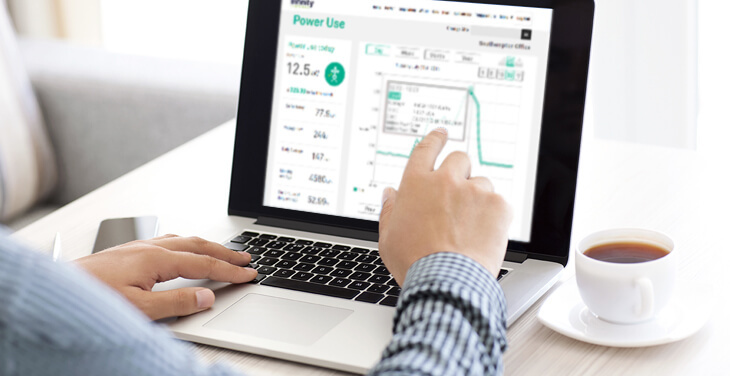 Infinity Energy can provide a powerful cloud based platform that provides a full insight to where and when you spend money on energy enabling you to make informed decisions for positive changes to cut energy wastage. With these insights, on average customers have proven to reduce their annual energy bills by 30%. Request a free no-obligation survey or call 0800 909 8882 for more information on our energy monitoring solutions.